»memoir»Does Your Name Tell a Story? I suspect that many people reading these words are toying with the idea of writing a memoir. When it comes to putting it all together, where do you start? If there is something intriguing about your name, that could be a good opening. Names can have much history, even tragedy. Names can lie, hide the truth, hide history, honour the past, give shelter, give hope. A birth name, as you will see, can represent freedom – freedom from oppression, freedom of speech. Olga is now 90, and her only sister (no brothers) still lives in Ukraine. Yulia is bedridden now, completely paralyzed, and she no longer reads. Olga’s story however, is also her story, her history, and she has a copy of it. It is a great comfort to her when her husband reads it to her, translating it into Ukrainian as he goes. It brings back her early days, her youth. The old Ukrainian folk songs her grandfather used to sing, the school house that was heated with straw, making their own flour, the Saturday night baths when bucket after bucket of water was carried up from the well and heated then poured into the big tub—kids first, Mom and Dad last. Then the banning of the Ukrainian language, then famine, then the arrival of the Nazis, then the train ride to work camps in Germany. Parts of the story are hard. But much better that those parts be acknowledged in print than forgotten. That’s one of the functions of freedom of speech. Then there’s Malala. Her name is now synonymous with speaking out for women’s rights. Her name is so crucial to her sense of self that her book I Am Malala opens with three pages of what her name means. When she was born female, people sympathized with her mother, and no one congratulated her father. Pashtun female babies in Afghanistan are not entered in the family tree, only male babies, but when an uncle arrived with the tree, her father broke with tradition. He drew a line from his name to a circle and in the circle he wrote “Malala”. Her father had already fallen in love with her, and knew she was different. Named after the Pashtun version of the French Joan of Arc, Malalai was the greatest heroine of Afghanistan. In 1880, the young and soon-to-be-married Malalai saw the men were losing the fight against the British. When the flag bearer fell, she marched onto the battlefield holding her white veil up high in front of the troops, shouting to them in the name of love to be strong, to be ready to die for their land. She was killed under fire, but her words turned the battle around. 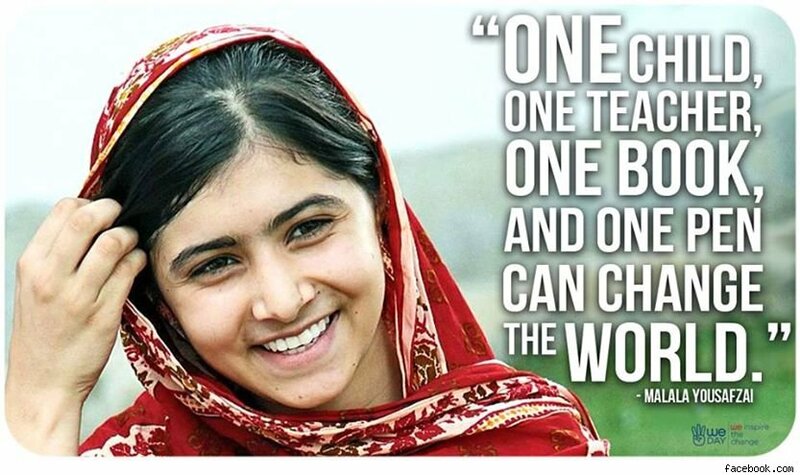 Shot by her enemy, like today’s Malala was shot by her enemy (the Taliban) for standing up for education for girls. But, “our” Malala survived. I beg you rise again. Rise again! Is it any wonder Malala became who she did? Or, was she sent by the gods? My parents named me after a song called Diane that they both liked. Nope, no revolutionary theme here. Although, from all accounts, I did revolutionize their lives. Do you have a story to tell about your name? I’d love to hear it. What an interesting post, Diane. I always wonder what people’s names mean, but didn’t know the origin of Malala’s. Yes, it’s fascinating. Nelson Mandela’s birth name means ‘Trouble Maker”! I was named after my mother’s mother who died before I was born. There’s a story there – the one about my grandmother who I never knew. Perhaps it’s time to write it while my mother is here to tell it. Thank-you for the idea, Diane. Marie, yes, writing your grandmother’s story with your mother as source is a great idea. You might like to share some of it on these pages one day.